The dirndl consists of a bodice, blouse, full skirt and apron. While appearing to be simple and plain, a properly made modern dirndl may be quite expensive as it is tailored and sometimes cut from costly hand-printed or silk fabrics. In the South German dialects (Bairisch), Dirndl originally referred to a young woman or a girl, and Dirndlgewand to the dress. Nowadays, Dirndl may equally refer to either a young woman or to the dress. The winter style dirndl has heavy, warm skirts and aprons made of thick cotton, linen, velvet or wool, and long sleeves. The colors are usually rich and dark. The summer style is lighter and more frivolous, has short sleeves, and is often made of lightweight cotton. Accessories may include a long apron tied round the waist, a waistcoat or a wool shawl. In many regions, especially the Ausseerland, vibrantly-colored, hand-printed silk scarfs and silk aprons are worn. As far as jewelry is concerned, women often sport necklaces, earrings and brooches made of silver, the antlers of deer or even animals' teeth. For colder weather there are heavy dirndl coats in the same cut as the dresses, with a high neck and front buttons, thick mittens and wool hats. In popular culture it is sometimes reported that the placement of the knot on the apron is an indicator of the woman's marital status, with a knot tied on the woman's left side indicating that she is single, a knot tied on the right meaning that she is married, engaged or otherwise "taken", a knot tied in the front means that she is a virgin and a knot tied at the back showing that the woman is widowed. The dirndl originated as a more hardy form of the costume we have today; the uniform of Austrian servants in the 19th century (Dirndlgewand means "maid's dress"). Simple forms were also worn commonly by working women in plain colors or a simple check. The Austrian upper classes adopted the dirndl as high fashion in the 1870's. Today, dirndls vary from simple styles to exquisitely crafted, very expensive models. The dirndl is mostly worn in Austria and Bavaria. It is used as an everyday dress primarily by older women in rural areas. Other women may wear it at formal occasions (much like a Scotsman wearing a kilt) and during certain traditional events. It is hugely popular also among young women at the time of the Oktoberfest in Munich (and similar festivals in southern Germany, Austria, Canada, and the United States), although many young women will only wear dirndl-style dresses (called Landhausmode), which may deviate in numerous ways and are often much cheaper. To actually understand the German clothing of the years gone by, it is important to understand the concept of tracht. Clothes helped identify a person's standing in society. Along with accessories, the style of facial hair, and adornments, the entire outfit and way of presentation was called tracht. It allowed people to know certain things about another person. These details included their marital status, their place of origin, and also their trade. According to these details the clothing patterns changed slightly. With time, these clothing patterns became more integrated, resulting in common designs. 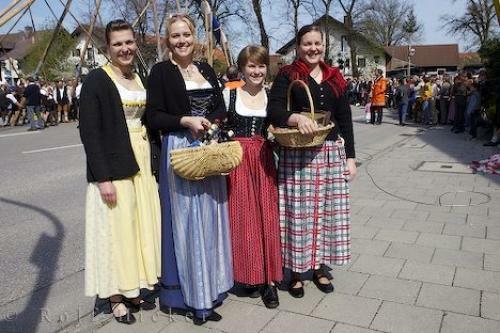 We have described for you two of the most common outfits worn by women and men in Germany, especially in Bavaria. In the the northern parts of the country, there were other styles of clothing that were prevalent. The word lederhosen translates to leather pants in German. These are knee breeches, and were worn by the Germanic men of the Alpine areas and the surrounding locales. The pants were made of leather. This traditional style was also worn by young boys. Lederhosens worn in the Bavarian region had features such as suspenders and front flaps, and these were quickly adopted by other countries. These pants were worn with shirts and sweaters made of coarse linen or wool. Other clothes teamed with the pants were wool stockings and country shoes. Jackets and hats were worn by some men. Today there are several clubs and societies that are devoted to the preservation of traditional German clothes. These societies are working towards reviving the clothing traditions so that more people choose to wear them on occasions like weddings, festivals, etc. Wearing trachts is a patriotic sign chosen to display their pride in their country and their ethnicity. Originally, the dirndl was the uniform of the Austrian servants. Traditionally, every village even had its own particular style of this dress, in accordance with the concept of tracht. The dirndl comprises many garments that make up the entire outfit. It was made up of a fitted bodice which was worn with a blouse, a full skirt, petticoat, and an apron. The blouse was generally made of either cotton or lace. Some women chose to wear the outfit without a blouse. The apron was more often than not of a contrasting color. For festive occasions, the dirndl was often accentuated with embroidery, elaborate hats, and accessories like lace, ribbons, trims, etc., that were plaited.